Helihopper by Oddrok is an amazing time killer arcade game for Android and iOS. 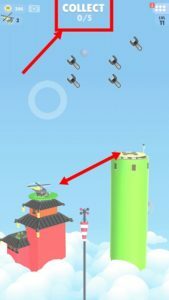 In this fun helicopter game, you hop from one helipad to another, but it would not be easy for the player in hard levels. Let’s take a look at all the things of Helihopper. The game starts with a tutorial in which you learn about the basic of the game; how to play, how to move from one helipad to another, and how to teleport(a difficult task, tips are mentioned below). Helihopper game comes with 70 challenging missions, and an endless mode, divided into three game modes; easy, normal, and hard. Controls are simple, you just sling and release after pointing out the perfect angle. Landing is the frequent task in most of the missions featured in Helihopper, your helicopter should land perfectly to another helipad. Hold down your finger on the screen, pull, point out the angle to another helipad, and release. That’s it. At each level of Helicopter, you are given a task like collect all the wrenches, teleport your helicopter, and more. Completing mission rewards you XP. Earn more XP to level-up your profile. How to unlock new game modes? Endless mode is divided into nine modes; three easy modes(unlimited side-hops), three normal(limited sidehops), and three hard(no sidehops). To unlock these modes, you need diamonds and your current level should meet the minimum requirements. For instance, to play hard mode, you should be on level 10. Level-Up, complete the set of missions. 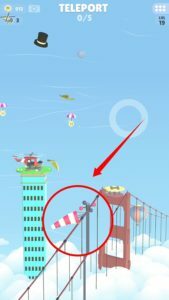 How to get more lives in Helihopper? 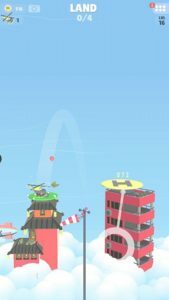 The game features ten types of copters, each copter can be upgraded using H points(can be collected by playing the game) and you can increase the number of lives. Just head to copter section of the game, unlock new copters, tap on the + button and spend the points. The main task in Helihopper game is to perfectly hop the helicopter to another helipad. First of all, check the task that you have to complete(at the top of the screen), after it, check the wind speed and direction, and then make the perfect angle; hold your finger/thumb on another helipad, point out, and release. There is a pole between the two buildings(two helipads), windsock is also there. Windsock indicates the direction and strength of the wind. Depending on the direction and speed of the wind, hop the helicopter to another helipad. Teleport is one of the difficult tasks in the helihopper game, instead of normal take-off, the player has to hop the helicopter in the opposite direction. It’s simple, depends on how you release the helicopter. Use the wind speed, if the speed is in the favorable area, then pull slightly, if not, then pull at all power. 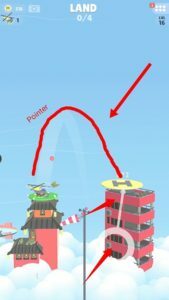 Helihopper is a great offline time-killer Android game.If you control the helicopter perfectly, then it would be easy to complete all the challenges. You should give it a try if you love arcade games. Download – Helihopper – here(Google Play Store).